Sen. Marco Rubio (R., Fla.) ripped former Secretary of State Rex Tillerson for undermining the White House on sanctioning Venezuela, while praising his replacement, Mike Pompeo, for harsh new measures against the Venezuelan regime and its interests. 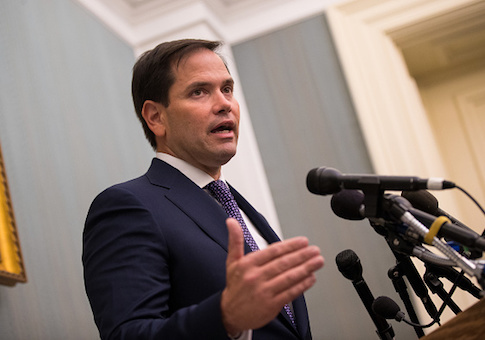 Rubio, the target of a suspected assassination plot by leading Venezuelan politician Diosdado Cabello Rondon, has continuously called for sanctions against Nicolás Maduro, Venezuela's authoritarian president, and his cronies. Venezuela has been devastated by socialist policies and faces food and medical shortages from its ongoing economic crisis. Rubio has emerged as a strong White House ally on Latin American issues, and he praised the Trump administration for issuing new sanctions on Monday meant to prevent Maduro from selling off Venezuela's debt to U.S. entities. The measures came on the heels of new sanctions last week against Cabello, the vice president of the United Socialist Party of Venezuela and an accused drug trafficker and money launderer. The U.S. also condemned Sunday's "sham" reelection of Maduro, which was internationally recognized to have been fraudulent and undemocratic. While Rubio had warm words for Pompeo and new National Security Adviser John Bolton for their influence, he blasted Tillerson for what he deemed prior inaction on Cabello. "The previous secretary of state protected and assisted the people who undermined the president on Venezuela," Rubio told Politico in a new interview. "Not a month goes by that the president doesn't bring up Venezuela to me. He is personally committed to this issue," Rubio added. He went on to say that Trump "finally has a team that will turn his orders into action. Like I said a few weeks ago, bringing Bolton into the NSC [National Security council] and Pompeo into State is bad news for Maduro and [Cuban leader] Raúl Castro." Politico reported that Rubio would not say which State Department personnel undermined Trump on Venezuela, writing, "Two senior government officials said the proposed sanctions against Cabello had been blocked at a National Security Council Deputies Committee meeting as recently as this month by Thomas Shannon, an Obama holdover who has spent about 35 years in the Foreign Service." Pompeo, an ally of Rubio who endorsed the senator in his 2016 presidential bid, overruled Shannon, according to the report. This entry was posted in National Security and tagged Marco Rubio, Mike Pompeo, Nicolas Maduro, Rex Tillerson, Trump Administration, Venezuela. Bookmark the permalink.